I recently completed a tenor ukulele, following a Hanalima plan. I started it in late August, and completed it in late October. Instead of posting each day's progress here on the website, I chose this time to post it on Facebook. I thought, at first, then, once the build was complete, I'd embed the Facebook posts here, as I have done with a few other projects. However, there were just TOO many posts to be able to do that here (it's somewhat of a tedious job to embed Facebook posts), so I decided to ditch that idea. So....that's what I will include here, if you are interested in taking a look at my experience in building this particular instrument. I loved building this instrument --- it turned out to be a nice, graceful shape, compared to a tenor I had built long ago, and I was able to try out a new French-polishing method I've been learning from Tom Bills' online French polishing course. And it sounds pretty good!!! But it was great fun! Today I was able to surprise her with it at her district office, thanks to the help of her co-worker, Jackie. I was really glad that Val had no clue that this was for her, all along. I think Kamalani (the uke) has found a nice home. 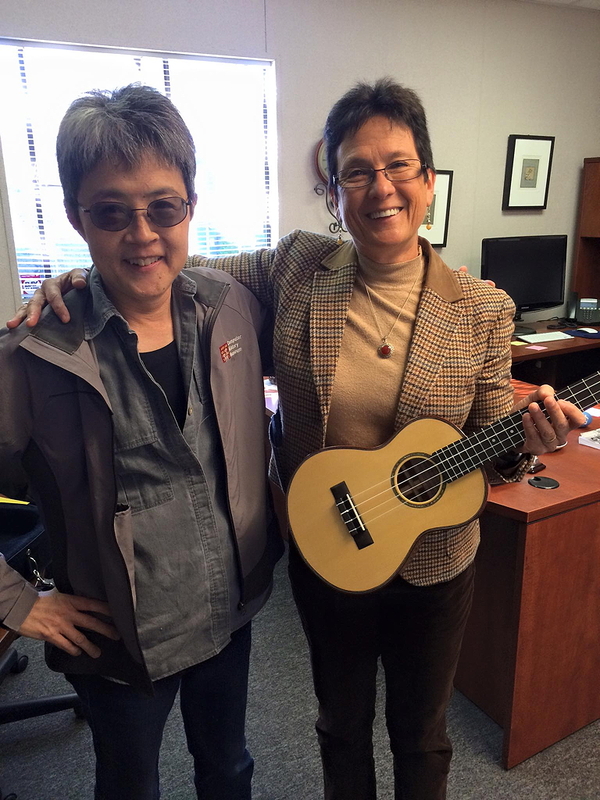 Here's what Val had to say, after I delivered the surprise to her: "I can't even begin to say thank you to an amazing teacher and artist, Kathy Matsushita who made me this beautiful ukulele! Kamalani will be with me for the rest of my life, and I look forward to many years of playing beautiful music. I am so proud to say I own a hand crafted KM ukulele!"